If you’re new to Oklahoma City or looking for a new Oklahoma City dentist, we know the options can seem overwhelming. Many patients end up simply choose the closest practice to their home, picking an office that’s in their insurance network, or finding some other quick way to make the choice. At Mitchell Smile Design, we encourage patients to take the time to really explore their dental office options before settling on an Oklahoma City dentist. 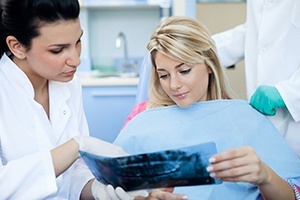 Patients who aren’t completely happy with their dentists are much less likely to maintain their regular dental checkups. Finding the right dentist is essential in order to keep your whole, healthy smile for life. We hope you’ll consider the Oklahoma City dentist and team at Mitchell Smile Designs for all of your oral health and hygiene needs. If you would like to find out more about our team or dental services, please don’t hesitate to call our office. We’ll be happy to answer any questions you may have or schedule an appointment with our team. An easy first step to finding the best Oklahoma City dentist is asking friends, family members, coworkers, and doctors for recommendations or referrals. If you’re new to the area, you may want to ask your dentist for a referral before you leave the area. Coworkers are another great option, especially if your employer provides a dental insurance plan that you and your peers will share. Your coworkers may be able to provide you with recommendations for dental offices that are in your benefit plan’s network. Trusted friends and family members can also offer good recommendations. Make sure to ask for specifics about what makes them go back to the dental office year after year. Online reviews are also a great way to hear about the patient experience directly from people who actually visit the dental team. Patients of Mitchell Smile Design have given us a five star rating on Google+, and we are so proud of the work we do to create a positive treatment experience for everyone we see. You may not be able to tell based on an online biography whether or not you’ll get along with a specific dentist, but you can learn more about his or her training and experience. This will assure you that you’ve chose a skilled, qualified professional who can safely and effectively provide the treatments you need to help you achieve and maintain your healthiest smile. At Mitchell Smile Design, Dr. Bradley Mitchell puts his years of training and experience to work helping patients of all ages receive the preventive, restorative, and cosmetic dentistry services they need to keep smiling. Dr. Mitchell completed his undergraduate studies at Oklahoma State University and he went on to earn his doctoral degree from the University of Oklahoma. Since completing his studies, Dr. Mitchell has participated in a number of continuing education courses to extend his knowledge of the dental field and stay up to date with the latest dentistry techniques and technologies. He is also an active member of many professional organizations, including the American Dental Association, the Oklahoma Dental Association, and the Academy of General Dentistry. Dr. Mitchell always goes above and beyond to deliver gentle, attentive dentistry services that exceed even the highest patient expectations. 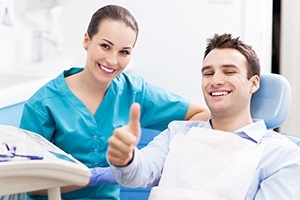 Finding a dentist who makes you feel comfortable is important, but almost every dentist will tell you, that they’re only as good as their dedicated team. In addition to Dr. Mitchell’s friendly dental care, our dedicated Mitchell Smile Design dentistry team offers a wide range of dental services to keep patients smiling. From the moment you arrive in our office, you’ll be greeted warmly and treated with kindness and respect. Our team of dental assistants and hygienists work hard to help patients achieve their healthiest, happiest smiles in a dental practice where patients always feel welcome and right at home. General dentistry practices typically offer the same types of treatments but finding an office that can provide more advanced services or accommodate the whole family may make it possible for you to limit time spent outside the office for advanced services. If you know for certain that you will need to receive a specific dental service, finding offices that offer these treatments may help you limit the number of dental practice options. At Mitchell Smile Design, we are happy to offer our patients a wide array of dentistry services to prevent common oral health concerns, provide accurate diagnosis in the early stages, and create personalized restorative and cosmetic dentistry plans to deliver flawless, healthy smiles. We also offer a wide range of advanced treatment options, including children’s dentistry, periodontal therapy, root canal treatment, dental implant supported tooth replacement, and complete cosmetic smile makeovers. We’re also available for emergency dentistry appointments if you or a loved one are in need of our attention urgently. If you invest in dental insurance coverage, you should find a dental office where your benefit plan is accepted. This doesn’t necessarily need to be the main reason you choose an office, but we understand that this should be a factor. 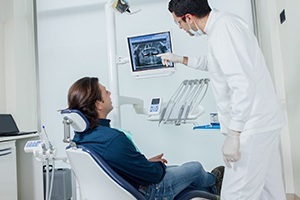 If you have a PPO insurance plan, you will be able to choose any office for care, but you will be guaranteed the highest percentage of insurance coverage from an in-network dental office. If you want to find out more about dental insurance and financing at Mitchell Smile Design, we would be happy to answer your questions. We are in-network with a variety of benefit plans and we’re happy to process and file claims even if we’re not in-network with your insurance provider. We accept payment at the time of service in cash, check, or credit, and we are happy to work with third party financiers to offer low and no interest coverage for qualified patients.